Wish you could change the shape of your nose? Rhinoplasty is a type of nose surgery that can improve the size and shape of the nose, either by increasing or decreasing the bridge, changing the angle, straightening out a bump, narrowing the nostrils or reshaping the tip. If you’re interested in rhinoplasty, Arkansas residents can count on our team at the Cosmetic Surgery Center for helpful information. We offer consultations for rhinoplasty, where you will meet Dr. Branman and discuss your goals and concerns. He will listen closely to what changes you want to make and explain all of your options. We are here to help you decide if nose surgery is right for you. This procedure can help change unwanted characteristics of your nose and improve symmetry, but it is important to remember that improvement, not perfection, is the goal. The best candidates are healthy individuals with realistic expectations. Although many seek to change the shape of their nose with rhinoplasty, patients may also choose to have nose surgery after a facial injury or to help relieve nasal obstructions. There is no upper age limit for nose reshaping and nasal reconstruction, but most surgeons prefer to not operate on younger patients until they have completed their growth spurts, usually in the mid teens for girls and the mid to late teens for boys. A person’s social and emotional adjustment is also taken into consideration. This is especially true for teens. Most rhinoplasties are performed on an outpatient basis and usually take 2-3 hours depending on the extent of the correction. There are different surgical techniques that can be utilized. With a closed technique, the incisions are made inside the rim of the nostrils. In an open technique, the incision is made across the base of the nostrils and nose. With either method, the soft tissues of the nose are separated from the underlying structures, allowing access to the cartilage and bone. The cartilage and bone are then altered and sculpted into shape. At the same time, internal problems, such as breathing obstructions can be improved by removing the obstruction or changing the shape of the obstructing matter. Also, if the nostrils are too wide, Dr. Branman can remove a small wedge of skin from the base for a more balanced appearance. A lightweight splint may be placed on the nose for several days after to help maintain its new shape and for protection after the procedure. Dr. Branman may also use nasal picks inside the nose to stabilize the septum—the dividing wall between the air passages. These will be removed in about two days. Patients typically have swelling and bruising around the nose and eyes. This will peak and begin to subside after the second or third day. Using cold compresses and keeping your head elevated will help reduce swelling, which should almost be unnoticeable after 2 weeks or so. A little bleeding is also common during the first few days. Any bruising will fade after a week or so and discoloration will usually disappear in two or three weeks. Camouflage cosmetics can be used to cover the discoloration after the first day or two. All splints, packing and stitches—if they’re not dissolved—will be removed usually by the end of one week, but they can be removed in up to three weeks, depending on your condition. It is common to experience some nasal stuffiness, particularly if you’ve had surgery on the septum. It may be a week or two before Dr. Branman will advise you that it is safe to gently blow your nose. You’ll need to be careful not to hit or jar your nose, or allow it to sunburn for at least 8 weeks while your nose continues to heal. It is generally advised that patients avoid strenuous activity for 2-3 weeks. Wearing glasses is also not recommended until healing is complete. In your follow-up visits during the months following rhinoplasty, Little Rock cosmetic surgeon Dr. Branman will examine and evaluate the healing process of your nose. Although your new nose may be hidden under some bruises and swelling at first, you’ll soon be able to appreciate your new facial profile. Remember that healing is a gradual process. Most of the swelling will subside after the first week or two, but it may take up to a year to really appreciate the final results. Be sure to protect your nose and always wear sunscreen so that you can enjoy the results for many years. Rhinoplasty is generally a safe cosmetic procedure with infrequent complications. While complications are unusual, you should discuss the risks and the possible side effects with Dr. Branman. In some cases, a second minor corrective surgery may need to be performed to achieve satisfactory results. You should have realistic expectations and realize that while most of the change will be apparent within three weeks, the finer refinements may take up to a year. 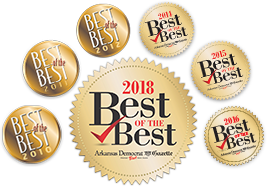 Rhinoplasty surgery, and all cosmetic surgery procedures with Dr. Branman, are performed at Arkansas Surgical Hospital or in our accredited surgical suite. For more information on rhinoplasty, Arkansas residents can contact our Little Rock cosmetic surgery office.